DAHLONEGA, Ga. – The eighth-ranked University of North Georgia softball team swept its competition once again on Saturday as part of the Steak ‘n Shake Classic, defeating Palm Beach Atlantic, 10-3, in game one and West Georgia, 4-1, in game two. With the day two sweep the Nighthawks improve to 8-2 on the season. The Nighthawks got going quick as Sydney Sprague hit her second home run in as many days with a long ball over the left field wall. The Sailfish answered with a run in the bottom of the first, including an RBI double from Magnolia West. The Nighthawks quickly responded in the top of the second by loading the bases and eventually bringing three runs home. Later in the fifth, Nighthawk hopes were high after four runs put them ahead 10-2 and in position end the game early with the run-rule, but the Sailfish still had some fight left in them. PBA kept the game alive with a solo home run from Kayla Knight just over the right field wall, giving the game its final 10-3 score. Amber Johns (1-0) was credited with her first win for the Nighthawks in 4.2 innings of relief work, that included four strikeouts. West Georgia struck early with a leadoff homerun from Marley Stowers to left-center. The Nighthawks responded in the bottom half of the second inning with a Shelbyk Hammontree single that brought Kaylyn Anthony home. 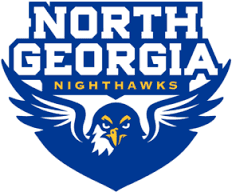 The score remained tied at one until the bottom of the fifth inning when the Nighthawks came up with a three-hit rally, including a single from Alisha Frierson and Kaylyn Anthony followed by and inside-the-park homerun from Hammontree to put North Georgia ahead 4-1. Despite a seventh inning push, the Wolves were unable to fight back from the 4-1 deficit, giving Kylee Smith (5-0) the complete-game win, with six strikeouts and just one run allowed. – The Nighthawk bats were led by Kali Turner in game one, who went 3-for-4 at the plate, batting in four and scoring two runs. – Shelby Hamontree provided all the offensive production in game two with four RBI, and two runs scored on two hits, including her inside-the-park homerun down the right field line. – North Georgia improves to 20-7 all-time against West Georgia. The Nighthawks return to action at the Steak ‘n Shake Classic tomorrow taking on Palm Beach Atlantic at Noon, before facing West Georgia at 2 p.m. Fans in attendance will have chances to win prizes from Steak ‘n Shake throughout the day.